← What Causes a Megaproject to Simply Fall Apart? 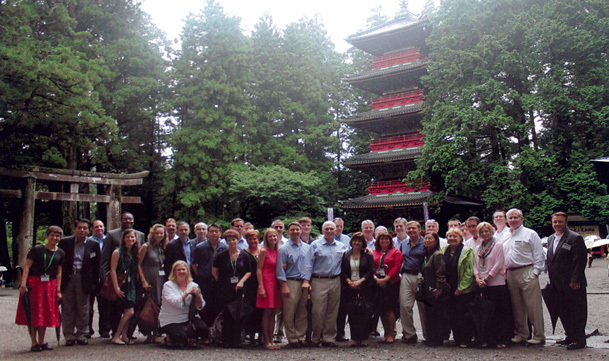 It’s no secret that Japan is Indiana’s largest source of foreign direct investment. There are more than 240 Japanese companies located in Indiana, with a large majority of those being automotive related. They account for approximately 45,000 jobs, and the trend seems to be that those numbers will increase. This provides exciting opportunities for us in architecture, civil, structural, environmental, and forensic engineering. That’s why American Structurepoint’s Mike Sheek (Business Development) traveled to Japan in September as part of Governor Mike Pence’s delegation on the State’s trade mission. The purpose of the trip was for the Governor to express his thanks to the many Japanese businesses who have invested in Indiana, as well as to meet with new potential companies who may also want to locate in Indiana. Mike had a few goals of his own, which included building new relationships with Japanese companies in hopes of earning their business in the future. He attended two receptions for Indiana-based Japanese companies (over 200 attendees at each function); a reception with Indiana’s sister state, Tochigi Prefecture; several private meetings with the Governor and Japanese executives; and plant tours of Subaru and two of their suppliers. In meeting with these executives, our hope is that it will enhance opportunities with their Indiana-based facilities. One of the greatest benefits of the trip was spending time with the other 40 delegates on the trip. Mike built relationships with the Governor and his staff, attorneys, accountants, mayors, economic development leaders, and others who have business interests with Japan. In a personal letter from the Governor, Mike was thanked for his participation in the mission. Overall, it was a great trip that gave Mike a special insight into the Japanese culture and a trip that will potentially bring new business to the area. This entry was posted in Uncategorized and tagged Indiana, Japan, Mike Pence, Willis R. Conner. Bookmark the permalink.